Some more cutsey bunny pinup type pictures. Actually, it's really three reworkings of the same basic idea. AzrielCat. I don't know the character, myself, but I think the drawings of her are neat. This is my version of one I saw on Rat. A generic bunny. I think the ears are all messed up. A bunnytaur! I'm going to try to color this one. Computer colored version of the Bunnytaur picture. A nekkid mousie, hopefully not too 'spoogey'. This picture is from a friend's suggestion. Two 'big haired' vixens doing a 60's dance called 'the bump', one red, one blue. Well, I think the hair is certainly big enough. 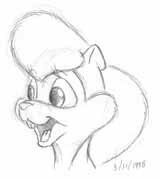 I know the proportions are a little toony, but that's what I do. 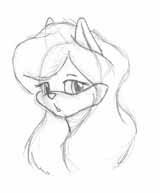 A couple of rough vixen head sketches, with anime elements. 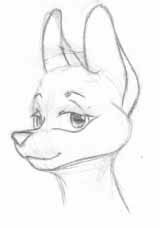 A slightly more polished version of the slightly anime vixen head. Anime style head. This one was deleted from Yerf by Scotty Arsenault himself. I have to admit, that rather shocked me.